A man in a hat with a bike and trailer checks out the scene at First Lake recently. 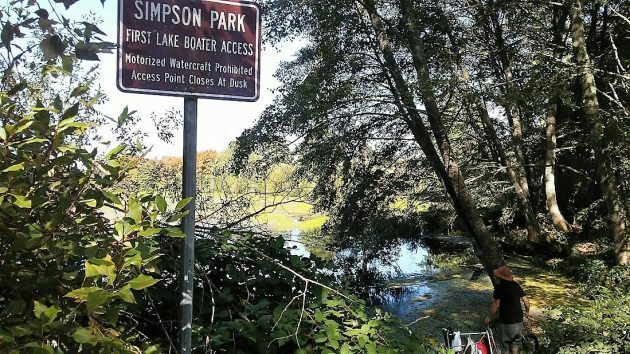 To get to the Simpson Park Trail, you pass what is advertised as the boater access on First Lake. But the conditions are such that there’s no great rush of boaters at this neglected Albany lake. Getting a small boat in there is possible, but first you have to carry it a ways because the gate to the trail at the Simpson Park parking lot is usually closed, presumably to keep vehicles out. And then, this pond is so choked with weeds and algae that paddling or rowing a boat would seem like too much of a chore. As the name of the lake implies, there are more of these former oxbows of the Willamette River. First Lake leads to Second Lake, which leads to a channel, and that leads to Fourth Lake, which gets back to the river. That would make the channel Third Lake, though it’s hard to see on Google Maps how this almost invisible ditch deserves to be called a lake. A few years ago, people contributing to an online forum reported catching big bass in First Lake, despite or maybe because of the weeds. Another view of First Lake from what the sign calls the boater access. Is there another trail that goes farther to the other lakes? I walk on Simpson park trail a lot and see many people walking there when I do. It’s a short walk though so I would love to know about another trail! 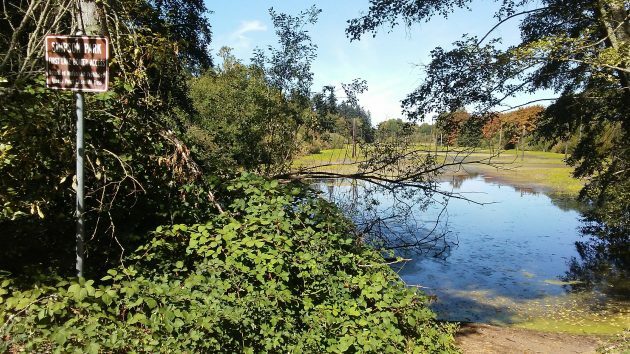 The Simpson Park trail is a little longer than one mile, so a walk to the end and back comes out to about 2.3 miles. It may be possible to reach the other lakes via the trail, but I’ve never seen let alone reached them. In 100 years those then living may well reflect on how “futuristic” our now population was in making the Talking Waters area. It may well then be a “Central Park” as in NYC! Maybe the community should start a cleanup and restoration project. Our group, the Willamette Restoration Volunteers, has been holding volunteer projects 1 or 2 times a month out there for the last few years. We’ve been doing manual restoration and have had to learn as we go, so I don’t blame Mr. Hering for not noticing much of a difference yet. However, our technical ability and the scope of our work is really ramping up this year. We’ve just finished cutting back a huge volume of blackberry, and our first spray treatment with the City is scheduled for this October. After that, we’ll be finishing the site prep by cutting back the blackberry again once the spray does its job, doing a small tree planting project in November, and then replacing the blackberry with ~2,000 native bareroot plants around next March. And don’t worry – we won’t be planting the boat access ramp. We’ll be clearing the blackberry from it, but lake access won’t be impeded. Once that’s all done, we’ll start looking into options for how to deal with all the invasive water primrose (Ludwigia hexapetala) that’s choking up the water itself. Great. Thanks for your response and for what you do. Please let me know how I can help. My family moved here from the east coast. The weather here is wonderful, the mountains, hills and fields are wonderful….. then we look around our “new” city or town as we would call it and it is baffling to us as to why nothing is kept up???? Things ,we are pretty sure, nice at one time….left to go to #*!*^*#…. no town workers?? ?..put the “homeless” to work to earn what they reap at the expense of the hard working citizens …it must be nice hanging with your friends, with your dog, bike or skate board , ciggarettes, cell phone..,,while i work for these luxuries some of which i cannot afford! Instead of taking care of what is here, new things are added…how long before the carousel lookes like the parks and city center …,dirty moldy benches, delapitated basketball, tennis courts, overgrown weeds and grass… how long before the wooden duck has to be re-done as maintenance and up-keep seem to be slim here and slim left town…and oh yes so am I. So long Archie, perhaps the next town will appreciate your concerns and opinions. Archie’s obviously never been to North Albany.